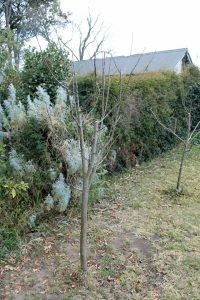 Apple trees after a winter pruning. This winter has been a quiet time in our garden. I’ve generally been too lethargic to get out into the freezing cold, and the garden has been complicit in my laziness, with very little growth going on. We’ve had virtually no rain since the downpour in May, and the grass has been shrinking rather than growing, so there hasn’t been the usual imperative to do battle with the lawn before everything is overrun. I did manage to get out and do some heavy pruning of the fruit trees. The orchard is quite tiny, and I have probably placed the trees too close together, so I have been trying my best to keep them under control (semi-bonsai’ed, as it were). 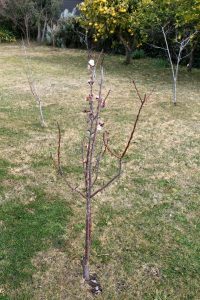 The apple, cherry and pear trees had sent up some solid leaders that I guess I should have cut earlier. They were all 3 to 5cm in diameter, so I cut them at the closest branching sections to belly button height (my belly button being easier to carry around than a tape measure). I then said sorry, gave them a good watering, and crossed my fingers that they would survive the ordeal. I’m pretty sure they’ll be fine, but they are currently doing their best to look dejected and vandalised. Our blooming apricot tree, August 2014. One half of the dual variety apricot tree has already burst into bloom. Well, more of a whimper into bloom actually, as the flowers only seem to last a couple of days before the frost or the chilled gusting winds kill them off. As a result, the buds and the dead brown blooms vastly outnumber the few pretty pink flowers. Fortunately I’ve spotted at least a couple of bees making a visit for the minimal pollen that’s on offer. 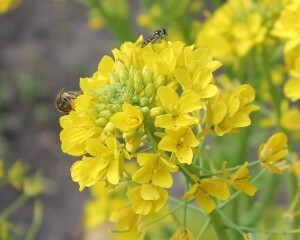 Speaking of bees and flowers, the cime di rapa have all burst into bright yellow blooms and have attracted quite a fan club. There are usually a few bees to be seen, plus some yellow butterflies, but mostly what I had thought were native bees, but have now realised are the less wholesome sounding hoverflies (which are apparently good for the garden, and look bee-like in the hind quarters, but their eyes are too similar to their nasty relatives for me to feel too good about them – it’s like having a hoard of Jeff Goldblums climbing all over our food). 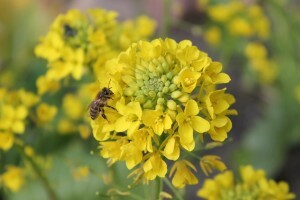 A bee enjoying our brightly flowering cime di rapa. Popular with all and sundry. The father-in-law has done a wonderful job of spreading out our too closely spaced rapa seedling, and we now have four beds devoted to them. We’ve been eating rapa and pasta weekly, plus providing gifts for the father-in-law’s many Italian friends. 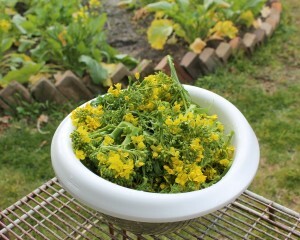 Some cime di rapa ready to be boiled and served with pasta. 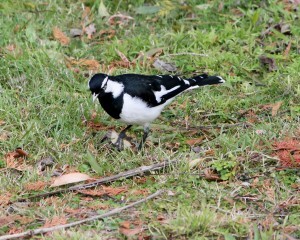 A bird braving the chill winter winds. I’m continuing to be amazed by the success of my efforts in covering parts of the garden with newspaper and mulch. It has been so easy to go around hand-weeding any unapproved shoots that have pushed their way through the mulch. I’m not sure if the spring rush will overtax my ability to keep everything neat, but thus far it has worked like a dream.